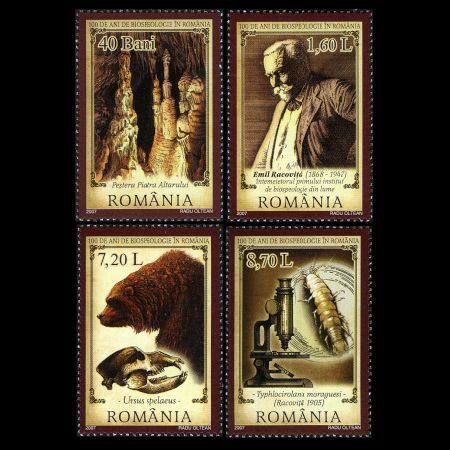 Romania 2007 "100 years since the foundation of biospeleology by the romanian scientist Emil Racovita"
Value RON 0.40 - Altar Rock cave of Bihorului Mountains. RON 7.20 - skull and the reproduction of the image of the Ursus spelaeus species. RON 8.70 - crustacean (Typhlocirolana moraguesi), discovered by Emil Racovita in 1905, in the sweet water lake of the Devil Cave, in the Mallorca-Baleare Island. Quantity TOTAL: 1,647,872 stamps: 1,599,872 stamps in sheets of 32 pcs. and 12,000 blocks of 4 stamps, meaning 48,000 stamps. 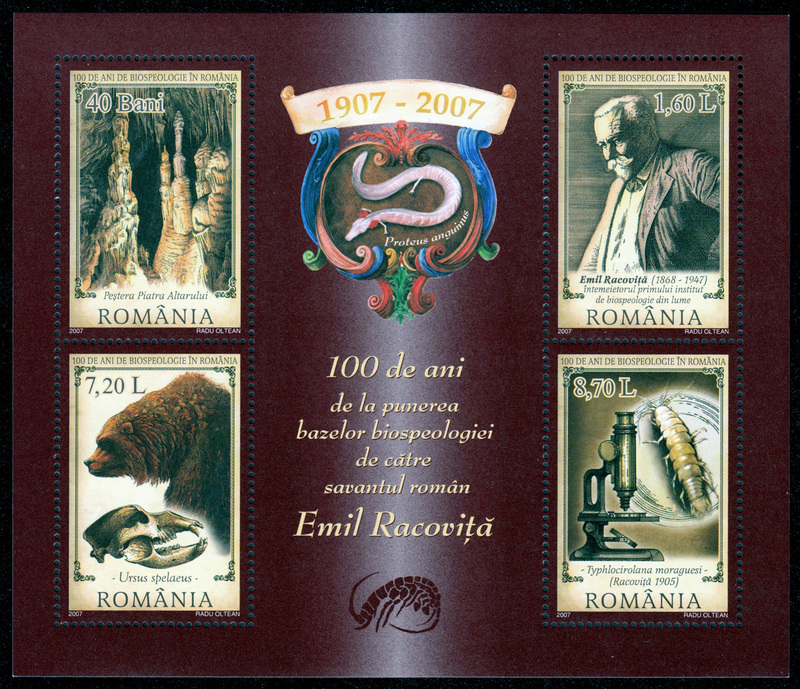 On the occasion of celebrating one century from the foundation of biospeleology by the wide-world recognized great Romanian scientist, Emil Racovita, Romfilatelia, the specialized company in editing and trading Romanian postage stamps, introduces into circulation the postage stamps issue 100 YEARS SINCE THE FOUNDATION OF BIOSPELEOLOGY BY THE ROMANIAN SCIENTIST EMIL RACOVITA. 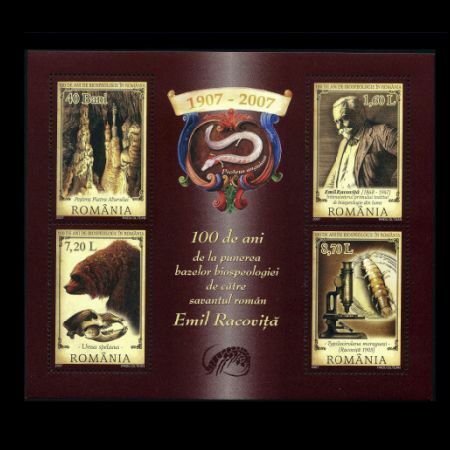 The Romanian speleologist and biologist Emil Racovita was born in Iasi, on the 15th of November 1868. 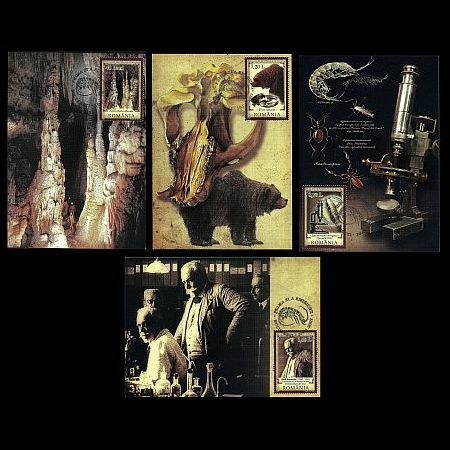 His passion for the natural sciences was aroused by the professor Grigore Coblcescu, during he studied at the United Institutes high school of Iasi. Fulfilling at first his fathers wish, Emil Racovita followed the Law Faculty of Paris, which he gave up in favour of the vocation he was destined for. Thus, the young Racovita graduated the Sciences Faculty of Sorbonne, having the famous scientist Henri de Lacaze-Duthiers as Zoology professor. In 1896, Racovita became famous among the European scientists, obtaining the doctor title, with a remarkable piece of work (Le lobe cphalique et lencphale des anlides polychtes - Paris). During the period 1897-1899 that he spent together with Amundsen aboard the Belgica ship, within the Belgian Antarctic Expedition, Racovita gathered 1600 zoological and botanical specimens. This collection allowed him to publish, on his return, an important work on cetaceans. On the 1st of November 1900, he became deputy manager of the Arago Oceanological Laboratory of Banyuls-sur-Mer, France, founded 20 years before. In 1904, Racovita made a crucial discovery, which was going to influence the rest of his life. The new species of crustaceans, found in the Cueva del Drach cave of Mallorca, fascinated him to such an extent that he would give up to the oceanological research in order to dedicate himself to the underground ecosystems. The publication of his work Essay on biospeleological problems, in 1907, marked the birth of biospeleology, which he defined as the science of life forms from the underground environment (caves and underground waters). In 1920, he returns to Romania to found, in Cluj, the first Speleological Institute of the world, where he remained director until 1947. One of his important work is Speleology, published in 1927. Emil Racovita was also President of the Romanian Academy (1926-1929), and later, between 1929 and 1930, he was appointed Rector of the Cluj University, where he taught the first course of general speleology of Romania. The work Evolution and its problems, published in 1929, approaches in a very original way the evolutionist theory, developing a phylogenetic and systematic perspective on the evolution of underground animals. By closely pursuing his aim to understand the natural history of the underground environment, he obtained remarkable results due to his biospeleology program: he explored 1200 caves in Europe and Africa, he gathered a collection of 5000 underground animals, and published over 66 works on the underground fauna, totaling almost 6000 pages. 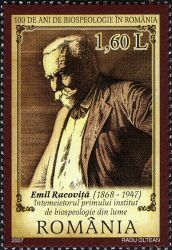 The scientist Emil Racovita died in 1947, at the age of 79, before reorganizing the Cluj Institute. Great lover of nature, Emil Racovita is one of the initiators of the protection of natural monuments of Romania. 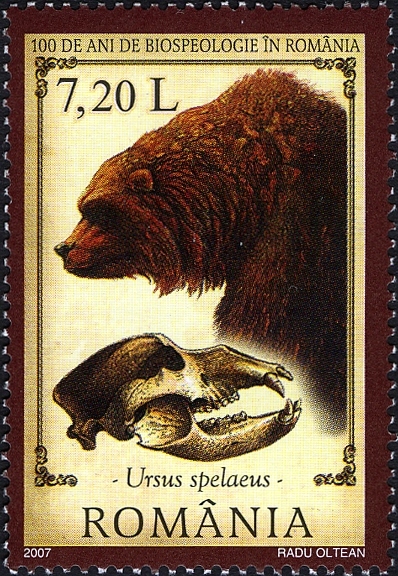 The postage stamp with the face value of RON 7.20 represents the skull and the reproduction of the image of the Cave Bear: Ursus spelaeus species. There are many cave bear's fossils found in Romania. Fossils of more than 140 cave bears dated more than 15,000 years ago, found in a cave in Chiscau, Bihor County, discovered In September 1975, a group of amateur speleologists from "Speodava" Club explored the cave for the first time and 5 years later it was opened for tourists. 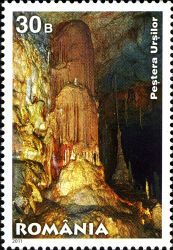 The cave called Ursilor Cave and illustrated on the postage stamp of Romania in 2011. The cave has an altitude of 482 meters. Its believed that the cave entrance was blocked by a fallen rock so that more than 140 bears attacked each other because of hunger. 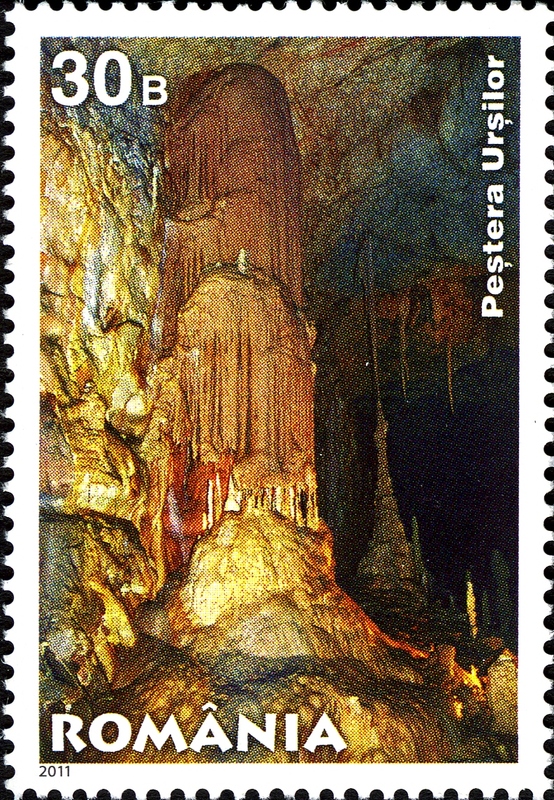 The postage stamp having the face value of RON 0.40 illustrates the inside of the Altar Rock cave of Bihorului Mountains. 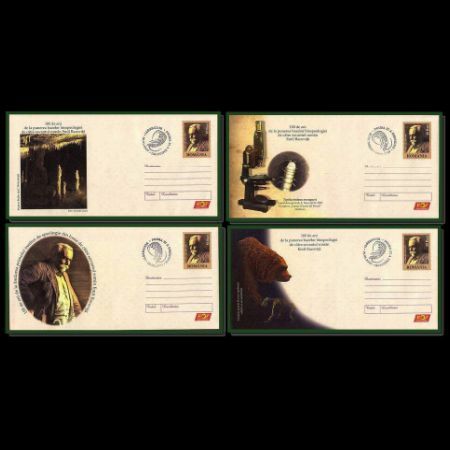 The postage stamp having the face value of RON 1.60 presents Emil Racoviţă, the founder of the first Biospeleology Institute of the world. 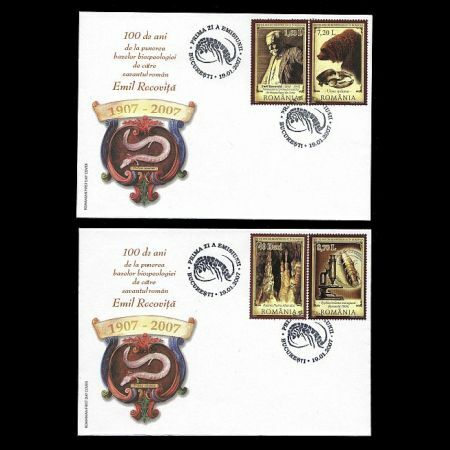 The postage stamp having the face value of RON 8.70 represents a crustacean (Typhlocirolana moraguesi), discovered by Emil Racoviţă in 1905, in the sweet water lake of the Devil Cave, in the Mallorca-Baleare Island. The image on the First Day Cover illustrates the most famous and rare vertebrate adapted to cave life. It is blind and depigmented. It lives in certain caves in the Dinaric Alps.